"She believed the public had a right to know about the toll of the wars in Iraq and Afghanistan"
The appeal argues for a 10-year sentence rather than the 35-year sentence she is currently serving at the military prison in Fort Leavenworth, Kansas. 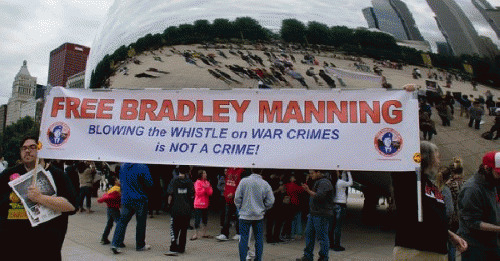 "For what PFC Manning did, the punishment is grossly unfair and unprecedented. No whistleblower in American history has been sentenced this harshly. Throughout trial the prosecution portrayed PFC Manning as a traitor and accused her of placing American lives in danger, but nothing could be further from the truth," the appeal states. "She believed the public had a right to know about the toll of the wars in Iraq and Afghanistan, the loss of life, and the extent to which the government sought to hide embarrassing information of its wrongdoing," it adds. Among those filing friend-of-the-court briefs in support of her appeal are the American Civil Liberties Union, Amnesty International, and the Open Society Justice Initiative. "It's very disturbing that the law forbade Manning from mounting a defense that took into account the public interest in any of her disclosures," said ACLU staff attorney Esha Bhandari in a press statement. "It violates the First Amendment for the government to punish the disclosure of truthful information without any consideration of whether the information was important to public discourse. The result is that the government is left free to inappropriately crack down on disclosures about its own misconduct, depriving the public of a vital check on government power," she added. "Leaks often come from the highest levels, including from CIA directors and the president's staff. People holding those positions of power have not been prosecuted under the Espionage Act for their disclosures. Many of these leakers seek to influence and even manipulate public opinion by promoting the government's chosen messages: that drone strikes work, that torture is effective, that the United States is doing everything right. Others pursue their own personal agendas, like Gen. David Petraeus, who shared highly classified information with his biographer." "Manning's severe punishment is a perfect example of the government picking and choosing who can speak to the press," they continue, calling it a cherry-picking that "is profoundly dangerous to our democracy."